Who doesn't want a 470-hp Jeep? 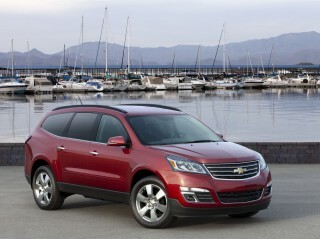 Stick with the base V-6 and four-wheel drive for maximum value. We won't blame you for a spur of the moment SRT8 purchase, but the mid-range V-8 makes sense only if you tow a lot and need the air suspension to even out the load. The 2013 Jeep Grand Cherokee blurs the SUV-crossover line expertly; better transmissions are at the top of the wish list. The Jeep Grand Cherokee is one of the original SUVs to help spawn the rush to tall wagons in the 1990s. Between the Grand Cherokee and the Ford Explorer, families found a new solution to shuffling the kids to soccer practice while avoiding the minivan and station wagon stigma. Moreover, the Grand Cherokee has given the Jeep brand mass appeal to shoppers who didn't necessarily need the off-roading prowess of the Wrangler, and it could be credited with helping Chrysler avoid yet another brush with death. Today the Grand Cherokee still is a critical part of the Chrysler lineup. And unlike some other utility vehicles, it hasn't blotted out its SUV past so much as to become unrecognizable. 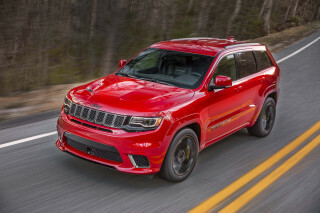 The Grand Cherokee still comes in Trail Rated editions, still has low-range four-wheel drive, still wants to be driven off-road--and at the same time, doesn't miss a beat on the utility side of its personality, while it does a pretty convincing job of connectivity, too. The Grand Cherokee doesn't look very much like its German cousins, but there's some Mercedes M-Class behind its tipped-back, seven-bar grille and under its nicely detailed, trimmed-down body. The current Cherokee's fixed the visual problems of the last one--it's not squat, chopped, and blocky--but there's some blandness behind its front end, some global familiarity in its rear three-quarters that wasn't there in the iconic 1992 original. Maybe that's from the DNA it shares with the M Class, but the softness on the outside pays huge dividends on the inside, where the hard points are the same, and all the hard plastics and grainy pieces of the last Cherokee have been banished. It's a distinctive look, thoroughly Jeep in its combination of shapes and textures, and another successful effort from Chrysler that points out one of the real strengths of the company--the way it can finish a cockpit, given the right budget and time constraints. The Grand Cherokee's just not the same. In terms of performance, that's an amazing development, because the slow progress Jeep had made toward civilizing the Cherokee took a huge leap forward with the 2011 model. Unchanged for the most part since then, this latest Grand Cherokee has a newly fluid feel on pavement that completely masks the considerable toughness and rugged ability baked into its hardware. Ride quality and steering have been vastly improved, to the point that the Grand Cherokee can have the soft-touch sophistication of a crossover. At the same time its four-wheel-drive systems hit the sweet spot of usability for casual off-roaders, but on-road drivers get even more attention. This might be the first Grand Cherokee that feels better on pavement than off, though the most advanced versions can still clamber over boulders and logs like they're about to be made into fur coats. The Grand Cherokee also sports Chrysler's first new V-6 engine in a decade. The 290-horsepower, 3.6-liter V-6 teams up with a fairly dated five-speed automatic that's better than average, but still a relic from its wrecked marriage. Together, the powertrain combines for some resonance and boom at midrange speeds that could use some attention, but good passing strength and adequate fuel economy. This drivetrain's good enough to make the optional 360-hp HEMI V-8 an afterthought to anyone except the big spenders eager to inject some dollars into the Obama economy, though the HEMI's available air suspension and advanced all-wheel-drive systems are the equal of anything you'll find in a pricier M-Class. Oh, did we forget the SRT8? The 470-hp HEMI addition to this year's lineup gets tight suspension tuning, flatter handling, its own cosmetic touches, even a layer on its touchscreen to measure its 0-60 mph times, estimated in the five-second range. Do want, even at the heady $60,000 entry price. The Grand Cherokee may not offer up the third-row seating or funky-flexible interior of some bigger crossovers, but it has two extraordinary performance vectors that few SUVs can offer--few, other than the Porsche Cayenne or the BMW X5 or of course, the M-Class, the trio of utes it stacks up against most directly, even at its cut-rate price. 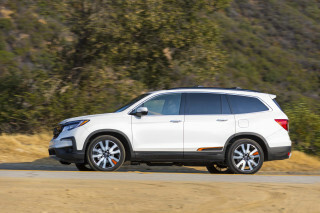 That makes it an extraordinary value, one that earns top safety scores and our admiration--for hanging on to some classic SUV traits while blazing some new trails in driving fun and sophistication. 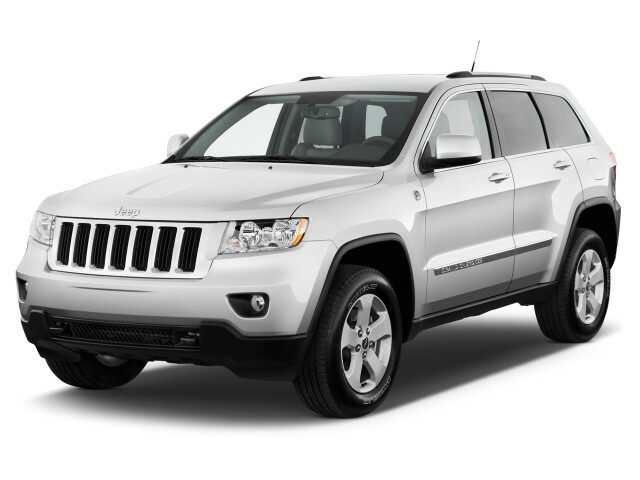 More upscale than ever, the 2013 Jeep Grand Cherokee has traded rugged good looks for a tamer, more polished appearance. Low-rent no more: that must have been the motto of designers when they signed off on the look of the latest Jeep Grand Cherokee. The first version had been drawn in the mid-1980s--and the second-generation Cherokee looked older and more dated than that one, with oddly blocky proportions. No more. Today's Grand Cherokee is pretty sophisticated, even pretty from some angles, though you could yard-sale your Weber and roast on its big slotted seven-bar grille if faced with the need. It's flanked by some small headlamps and blessedly free of the roundels, stars and wreaths that clamp on the front ends of some luxury SUVs. It could actually use more visual heft, the further you gaze down its sideview: it's rendered with details that can look a little too fine, and the balance of the front end peters out toward the back like the old VW Touareg or the current BMW X5. That raises the one consistent complaint we have about the look—and it's hard to muster more--that it might be too derivative, a bit excessively refined compared to Cherokees of the more distant past. Inside, the Grand Cherokee's even more of a resounding success. There's a chunky three-spoke steering wheel,a usefully arranged center stack of controls capped with inoffensive metallic-plastic trim, and on some versions, real wood trim on the dash, doors,and the steering wheel. Clean ergonomics are just part of the effect; the Grand Cherokee's materials don't repel your touch, like the feel of some other recent Chryslers. This is probably Chrysler's best interior, with the Ram pickup coming a close second. The engines are a generation ahead of the transmissions; the Grand Cherokee's handling finally is up to the on-road task as well as off-road. There's only a small set of vehicles that have both good on-road and off-road performance, and among five-passenger vehicles, even fewer. The Grand Cherokee's the first one that comes to mind, from mud-loving Trailhawk models to the most powerful HEMI version of all, the SRT8. The Grand Cherokee branches out from a single body style into three very different directions, offering reasonably frugal operation, luxurious power, or screaming thrust, all depending on which drivetrain you choose. There's also a variety of transmissions, four-wheel-drive systems, even a choice between air and conventional steel-coil suspensions, all part of the broad performance envelope that makes the Grand Cherokee a fit for so many uses--on par with vehicles like the BMW X5, Mercedes-Benz M-Class, VW Touareg, even the Porsche Cayenne, or something as prosaic as the Subaru Outback. At the entry point into the lineup, the Grand Cherokee makes it work with a 290-horsepower, 3.6-liter V-6, a relatively new powerplant dubbed the Pentastar, now used across a wide swath of the Chrysler lineup. The new six incorporates a lot of technology that had been wanting from Chrysler's carryover and hanger-on engines for decades; the 3.6 can run on E85 ethanol blend, it has variable valve timing, and good midrange power. In each application since it's also felt more smooth and sounded less boomy, but we've noticed in the Grand Cherokee some resonant noise at freeway entrance speeds. Missing from the list of technology: direct injection, a big step forward for economy that's said to be coming within the current Cherokee's life cycle. Regardless, the engine's powerful and smooth enough to make it a viable choice, though we're eager to see its outdated five-speed automatic swapped out for Chrysler's new eight-speed unit, for fuel economy and drivability reasons. The torquey optional engine is rated at 360 hp, and the 5.7-liter V-8 is more attuned to those who need its towing capacity on a regular basis. It's not badged a HEMI, but it's one in everything but name: it sounds like a HEMI, pulls like a HEMI, is identical to the HEMI-badged engines of just a couple of years ago, before fuel economy became such a selling point (and before Chrysler's parent company wore Italian loafers). It's aurally superior, but the HEMI's not such a huge improvement in everyday driving that it's worth the immense fuel-economy penalty. The V-6 version ekes out 17/23 mpg in rear-drive V-6 versions, or 16/23 mpg for the four-wheel-drive model; the V-8 musters only 13/20 mpg when coupled to four-wheel drive. At the pinnacle of all things Grand Cherokee, there's the SRT8. As Chrysler tries to lift that SRT imprint into brand status, it's easy to see how this model could be one of its centerpieces. 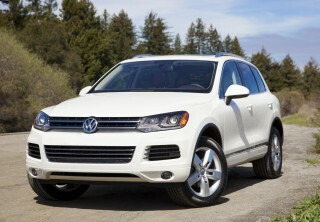 It's such a capable SUV, it bears comparison with Porsche's Cayenne--at sometimes half the price. The 6.4-liter V-8--a HEMI here too--tears around with 470 horsepower, channeling it to all four wheels through a five-speed automatic transmission with paddle shift controls. The claimed 0-60 mph time of 4.8 seconds isn't the only impressive number: the quarter-mile's pegged in the mid-13s, top speed hits 160 mph, and 60-0 mph braking cuts things short in just 116 feet. The downside, and there's always one, is the 12/18-mpg fuel economy, just 450 miles per big tank of gas. It's true performance art, and extravagant in ways you might never associate with the Jeep name. Further beneath its skin, the Mercedes contribution to the Grand Cherokee’s upbringing is more invisible. The Jeep's unibody architecture is stiffer and sounder than ever before, and that enables the steering and steel or electronic air suspensions to do their jobs more precisely than ever. No more live axle: the latest Cherokee's suspension is independent all around, and it gels with the steering to create crossover-like road manners. No more boundy ride or vague steering: the Grand Cherokee handles pavement about as well as a Honda Pilot, if not with the carlike ride motions of a Flex. With the Limited and Overland editions, there’s an available Quadra-Lift air suspension that can raise the Cherokee from 4.1 inches to 10.7 inches off the ground—great for off-roading, and even more settled on-road. For the times you want to explore new territory, the Grand Cherokee can be ordered with one of three four-wheel-drive systems. The basic Quadra-Trac I is a standard locking differential in the middle, with power split 50:50 front to rear. Quadra-Trac II can split torque variably from front to rear, as traction disappears at either end; Quadra-Drive II adds on an electronic limited slip differential across the rear axle so that the Grand Cherokee can respond even more intelligently to slipping and sliding. You’d want the most extreme choice for the most extreme duties, but our favorite is the plain base setup—it’s lightweight, simpler, and more than enough traction control for casual drivers. On top of all this, Jeep grafts a Selec-Terrain system to the torque-splitting systems. Selec-Terrain lets you choose one of five traction-control modes according to driving conditions: Auto, Sand/Mud, Sport, Snow, and Rock. In concept it’s a lot like the system in the Land Rover lineup; in practice, the Jeep version requires you to intervene more with the gas and brake. It’s useful stuff—if you don’t already know to take it slow and steady when conditions aren’t perfect. Lastly, with the rear-drive V-8 Grand Cherokee, Jeep claims a 7,400-pound towing capacity. SRT8s, of course, get their own tuning, with adaptive air suspension and a "Selec-Trac" governing body that controls it and the stability control, transmission shift programming, transfer-case torque management, electronic limited-slip management, throttle and cylinder-deactivation controls, all split among five modes: automatic, Sport, Tow, Track and Snow. It's also working in concert with Quadra-Trac to ship torque around--all to one rear wheel if need be--to balance out traction on the SRT8's 20-inch, 45-series Pirelli all-season run-flats or optional P Zero summer tires. The sacrifice? SRT8s can tow only 5000 pounds while they turn in about 0.90g of grip. You'll never be able to compare an SUV driving experience to this one again unless you sample a Cayenne Turbo or an ML63 or an X5 M--it's flat, sharp, full of raucous engine noises, maybe a little agitated in its Track ride motions, fully tweaked for a great time. Great seats and a spacious cabin do justice to the Grand Cherokee's vastly improved fit and finish. There's more cabin space and cargo room in this Grand Cherokee than in Jeeps of the past. That's because the latest generation sports a longer wheelbase than before, and the space it grants is used more effectively. Not only that, it's finished in more appealing materials, to a higher standard--and that adds luster and value to the Jeep's sticker price. In its 2011 redesign, the Grand Cherokee grew by 5.3 inches between its side wheels. The longer wheelbase has not only smoothed out its ride, it's also boosted leg room in both the front and the back seat, and allowed for bigger doors that make climbing in and out of the Jeep easier than ever. In the front seats, driver and passenger will notice wider cushions, and in base models, a fair amount of flatness in them. The bottom cushions can seem a little short, too, but with a little adjustment, it's not difficult to find a good driving position--and on vehicles with leather seats, there's more support formed into the bolsters. The Grand Cherokee's cabin is wide enough to put some distance between those passengers, too--they can make elbow contact on the center console, or rest an arm on the door panel, but it's by choice. Most of the added space is devoted to making rear-seat passengers more comfortable. In the old Grand Cherokee, the knee and shoulder room were tight, for such a large, tall vehicle. Now three adults have a good shot at sitting in the back seat comfortably; two will be quite happy, with plenty of room to slouch and fold down the center armrest. The seatbacks recline for even better comfort, all the better to enjoy those four additional inches of leg room. All versions of the Grand Cherokee are rated at the same storage space, about about 35 cubic feet behind the rear seats. This Jeep doesn't have a third-row seat option--for that, you'll have to switch to the Dodge Durango, and hopefully not a competitor like the Honda Pilot or Ford Explorer. The tailgate has flip-up glass or you can raise the entire liftback; on the ritzy versions, the cargo area gets fine padding and trim bars. You can flip down the rear seats with a single lever, and on some versions the front passenger seat will fold flat, too—just in case that grandfather clock needs a new home. Our favorite storage detail: The removable dual bins hiding under the cargo floor, molded to fit around the spare tire. At first glance, they look right-sized for a six-pack on ice. We're just saying. Safety scores are good, mostly, and the Grand Cherokee offers some high-tech safety options. The current Jeep Grand Cherokee has proven to be a safe performer, scoring well in crash tests in the past two years, with a minor blot on its record and some missing information for the 2013 model year. The insurance industry-funded Insurance Institute for Highway Safety (IIHS) called the Grand Cherokee a Top Safety Pick in the 2012 model year; it carried over its 2012 performance. The IIHS hasn't updated its 2013 information as of yet and it's contemplating the addition of a more severe front-impact test to its rankings, so for now, the structurally unchanged Grand Cherokee is without a rating from that agency. The National Highway Traffic Safety Administration (NHTSA) has updated its scores, and it awards the Grand Cherokee four stars overall, with a five-star rating for side impact protection. In rollover resistance, the rear-drive Jeep rates only three stars, more typical for SUVs than crossovers, while four-wheel-drive Cherokees are rated at four stars. All the usual airbags and stability control systems are standard in the Grand Cherokee, as are trailer-sway control, hill-descent control and hill-start assistance--functions of anti-lock braking and clever programming. Active headrests are standard as well. Among its worthwhile safety options are a rearview camera and parking sensors; blind-spot monitors; adaptive cruise control; and a collision-warning system that warns drivers when vehicles in the lane ahead are approaching rapidly. The airy Grand Cherokee provides drivers with great visibility. The hood’s shaped to give a good sense of the front corners, and the pillars are thin and let the driver gauge the rear quarters well. The Grand Cherokee's rife with luxury and performance options, from Nappa leather to wireless internet to performance telemetry. The Jeep Grand Cherokee's standard features check the usual boxes, but it's in tech features and infotainment where it blurs the line with traditional "luxury" SUVs. 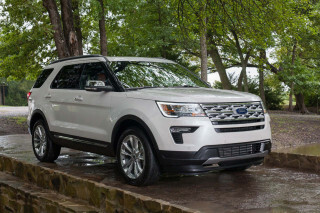 It's one of the most digitally advanced utility vehicles available, period, even counting the Ford offerings with its "Touch" systems--the Flex, Explorer, Edge, and Lincoln MKT and MKX. Standard equipment on the 2013 Grand Cherokee includes power windows, locks, and mirrors; air conditioning; a power driver seat; cruise control; push-button start; a tilt/telescope steering wheel; and keyless entry. All versions have an audio system with an AM/FM/CD player, a USB port, and SiriusXM satellite radio. From base models, the Grand Cherokee walks through a range including Laredo, Limited, Overland Summit, and new Trailhawk editions. It adds features on the way, including 19-inch wheels; leather seating with a power front passenger seat; a power tailgate; heated and ventilated front seats; heated rear seats; a power telescope/tilt steering wheel; a wood-trimmed steering wheel; a panoramic sunroof; xenon headlamps; and a top-flight sound system with 506 watts of power. The Trailhawk, offered with either powertrain, comes with off-road-specific hardware, including 18-inch off-road tires; an air suspension; off-road-tuned traction control; its own badging and black and red accents; and black suede and leather seats. On the technology front, the Grand Cherokee plugs into the data slipstream via Uconnect Web, adding wireless connectivity and in-car hotspots to its portfolio, making it even easier to stream video to portable devices and to passengers needing entertainment (now that streaming-TV options have been deleted from the Cherokee's menu). Bluetooth and navigation systems are available. A special mention goes to the Grand Cherokee SRT8. It has its own standard features, from cosmetic touches like paddle-shift controls; power tilt/telescope steering; leather-trimmed and heated steering whee; leather and suede seats; carbon-fiber interior trim; metallic pedal pads; and a vehicle information center in the gauges. There's also Performance Pages, which displays functions like 0-60 mph times, braking distances, and quarter-mile times, for those places and times that let you exercise the SRT8's massive tires and HEMI horsepower. Options on the $60,000 SRT8 include a dual-pane sunroof, a luxury package with leather trim and a power tailgate, and a harman/kardon 19-speaker, 825-watt audio system. SRT8s also come with a free day of driving instruction at one of a handful of selected tracks around the country. Gas mileage will get better when the Grand Cherokee gets Chrysler's new eight-speeds--but that hasn't happened yet. With a new powertrain and a new body in the 2011 model year, the Jeep Grand Cherokee has made progress in its quest for better fuel economy. It's missing a big piece of the equation, though, and that puzzle-filler doesn't look like it will be ready until the 2014 model year. Meanwhile, the Grand Cherokee soldiers on, offering some of the lower fuel-economy ratings among mid-size SUVs and crossovers, particularly when you blend in the results from the SRT8--it's thirsty enough to match the three-row Mercedes GL550, for example. The EPA says the base rear-drive Grand Cherokee, with a V-6 and a five-speed automatic, is rated at 17 miles per gallon city, 23 miles per gallon highway. 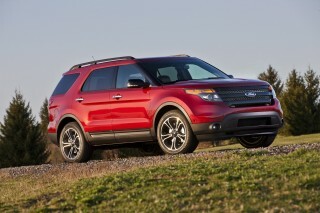 Adding four-wheel drive lowers the numbers to 16/23 mpg. 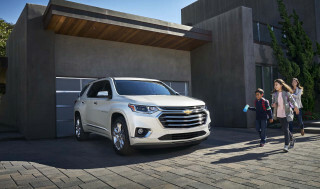 Those numbers are competitive, but not with the likes of the Ford Edge or Subaru Outback--but with vehicles like the seven-passenger Ford Flex and Chrysler's own seven-seat Dodge Durango. Stepping up to the V-8 edition lowers gas mileage to 14/20 mpg when rear-wheel drive is specified; with four-wheel drive, fuel economy falls to 13/20 mpg. Neither engine is yet offered with Chrysler's latest eight-speed automatics, coming for the 2013 model year to the Ram pickups and already available with six-cylinder Chrysler 300 and Dodge Charger sedans. It makes those vehicles much more efficient--and it'll be a worthwhile upgrade in the Grand Cherokee, for sure. It's almost a footnote by sales volume, but though we heartily approve of its slamming performance, the SRT8 gets dismal fuel economy of 12/18 mpg. Very nice car. Even if this car is a few years old, it still runs well. Not perfect, but totally awesome! I happened to have found the rare JGC Trailhawk limited edition with a large discount and it's a blast to drive! The interior is very well crafted with lots of vinyl and leather, and very minimal gaps between... I happened to have found the rare JGC Trailhawk limited edition with a large discount and it's a blast to drive! The interior is very well crafted with lots of vinyl and leather, and very minimal gaps between plastic panels. The leather/suede seats are quite firm but they keep you in place like a Jeep SRT's seats. The exterior is very pleasant to look at without all the chrome an ordinary Grand Cherokee has, as this instead has darker "mineral grey" wheels and exterior trim, a matte black hood decal, and the interior has red stitching. It has the 5.7 HEMI and Quadra-Drive II with a limited slip differential. Not as good locking differentials in a Jeep Wrangler, but this is still spectacular off-road. 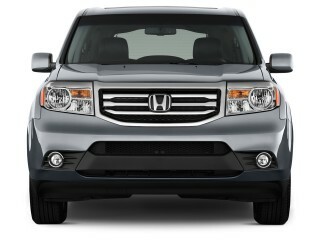 The vehicle has good crash tests other than barely doing well with the IIHS small overlap crash test. 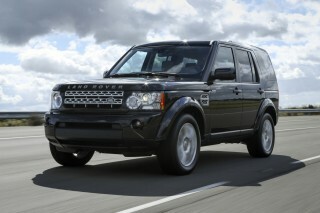 Bought one of these in CRD diesel 3L after testdriving one. The burst of speed when the throttle was pressed was neck-wrenching!! Had one of those extremely rare (for me!) moments, when the brain said "you... Bought one of these in CRD diesel 3L after testdriving one. The burst of speed when the throttle was pressed was neck-wrenching!! Had one of those extremely rare (for me!) moments, when the brain said "you gotta have one"!! Were comparing this and Nissan Pathfinder as possible replacements for our 1996 Prado GXL petrol which we just love to death. The Jeep won on the incredible power, the Nissan lost when the family and I nearly bumped our heads on its cabin roof as we passed over a minor hump in the road surface that we hadn't even noticed with the Jeep (took the same route). We were specifically after a comfy family cruiser which could handle occasional "rough and tumble" beach/bush track work, on probably a 90% bitumen, 10% off road basis. Then only other design brief was that it had to better the Prado's 13L/100Km fuel return, and naturally, had to have all the modern safety stuff the Prado doesn't - airbags and the fancy programmes. Well - we sure got what we were after. The Jeep is the family's favourite from a comfort perspective, and it's amazing fuel figures of around 7.8L/100Km on the highway and 8.2 averaged out (fully laden) were beyond our wildest dreams!! It's been to the beach and easily handled the sand - notwithstanding the prissie stock tyres (Michelin). We have total confidence on the bush tracks too. We purchased the adjustable air suspension ... which bumps around like dickie false teeth on higher settings (we'd researched this, so were expecting it), but allows some very reassuring ground clearance. The sound system is well above average for the class, with an extensive hard drive capacity. Our only grizzles - poor high beam (but terrific low!! ), merciless on the stock tyres - these will need retiring at around 30K (we routinely get 80-90K from our other vehicles) - maybe the Mickey Thompsons we plan on putting on will see an improvement there, no manual gearbox option.